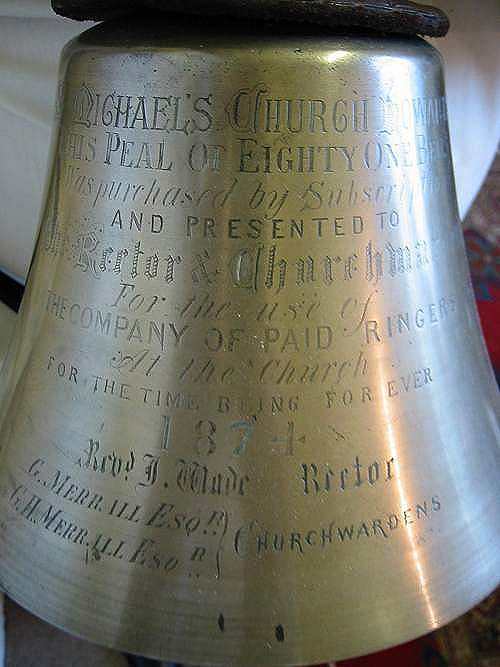 The traditional English art of ringing a set of tower bells in an intricate series of changes, or mathematical permutations (different orderings in the ringing sequence), by pulling ropes attached to bell wheels. 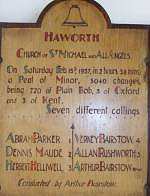 On five, six, or seven bells, a peal is the maximum number of permutations possible (120, 720, and 5,040, respectively); on more than seven bells. 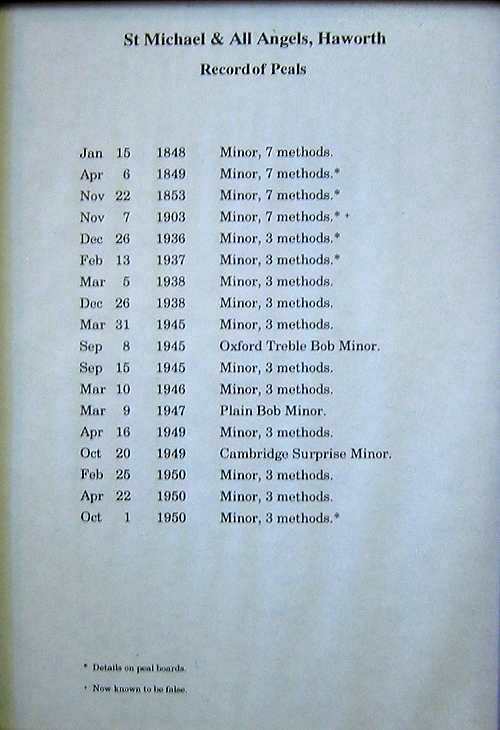 Jan 15 1848 Minor, 7 methods. Mar 5 1938 Minor, 3 methods. Dec 26 1938 Minor, 3 methods. Mar 31 1945 Minor, 3 methods. Sep 8 1945 Oxford Treble Bob Minor. Sep 15 1945 Minor, 3 methods. Mar 10 1946 Minor, 3 methods. Mar 9 1947 Plain Bob Minor. Apr 16 1949 Minor, 3 methods. 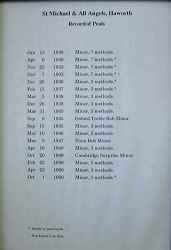 Oct 20 1949 Cambridge Surprise Minor..
Feb 25 1950 Minor, 3 methods. Apr 22 1950 Minor, 3 methods. The inscription on the bell. 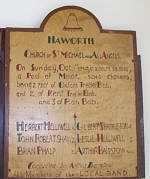 They spelt Haworth as HOWARTH! 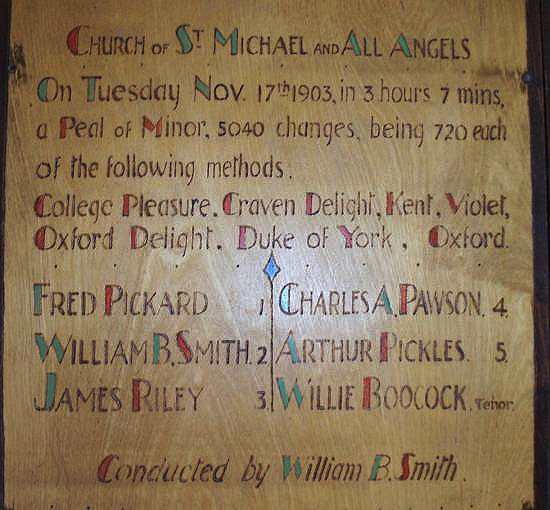 On Tuesday Nov 17th 1903, in 3 hours 7 mins, a Peal of Minor, 5040 changes, being 720 each of the following methods. College Pleasure, Craven Delight, Kent, Violet, Oxford Delight, Duke of York, Oxford. Conducted by William B. Smith. 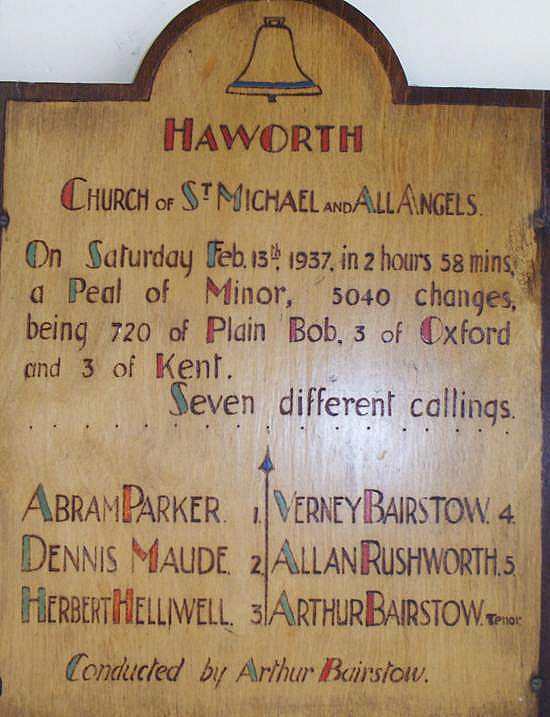 On Saturday Feb 13th 1937, in 2 hours 58 mins, a Peal of Minor, 5040 changes, being 720 of Plain Bob, 3 of Oxford and 3 of Kent. 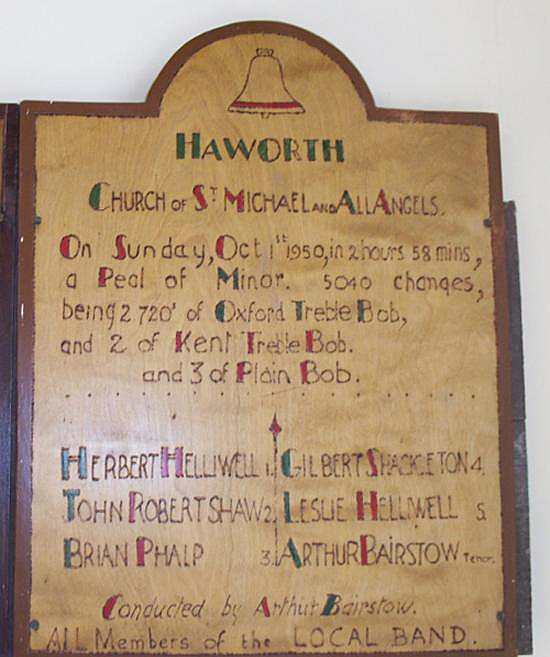 On Sunday Oct 1st 1950, in 2 hours 58 mins, a Peal of Minor 5040 changes, being 2 720 of Oxford Treble Bob, and 2 of Kent Treble Bob and 3 of Plain Bob. All Members of the LOCAL BAND.